If you are like most people that depend on their laptop for work or play, you need it for day to day tasks. What would happen if the hard drive crashed or Windows just refused to work for whatever reason? You would probably be lost for a few days waiting for a replacement hard drive or re-installing Windows. Hopefully you already back up your data regularly or maybe even have an image of the drive on an external drive. If you want that added step of security of not losing any time because of a crashed hard drive or OS, a cloned drive is a good option. Cloning the hard drive is also a good way to upgrade your hard drive without re-installing Windows or your programs. If something goes awry, simply put the cloned drive in the laptop and continue on with your day to day tasks. 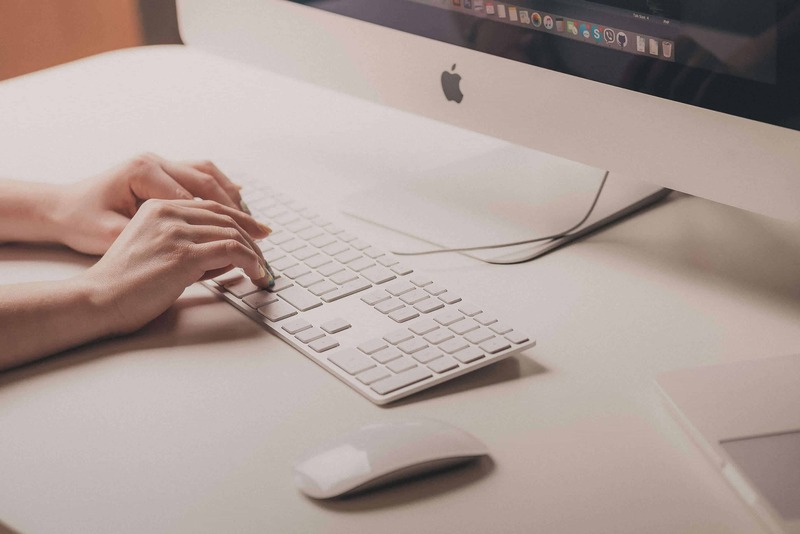 If your laptop is important to perform your day to day tasks, have a spare drive handy. In previous reviews of Acronis True Image, we took an image and put it on a USB flash drive or other backup media. If you want total protection from a fried hard drive or Operating System, this is what you need to do for peace of mind. The first step is to find out how big of a drive is in the system. For the purpose of this review, there is a 750 Gigabyte Western Digital drive in the laptop. I chose to purchase pretty much the same drive along with a hard drive enclosure. Both a fairly inexpensive purchase. This is what the setup looks like using the Windows Disk Management utility. 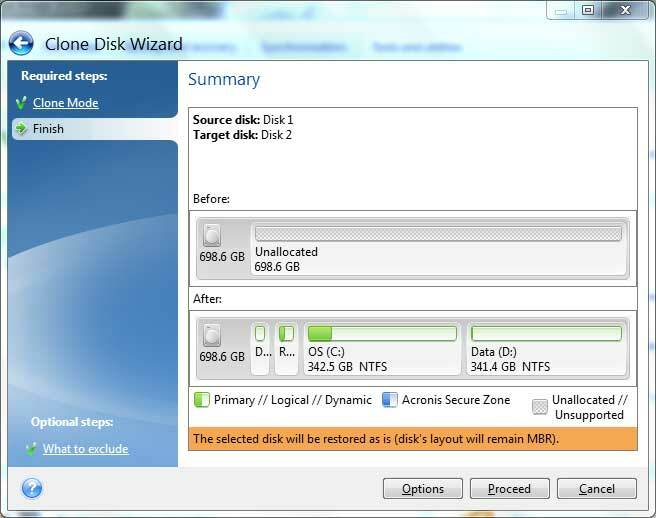 Open up Acronis True Image and go to the Tools and Utilities Tab where you will find the Clone Disk tool to copy partitions from one disk to another. 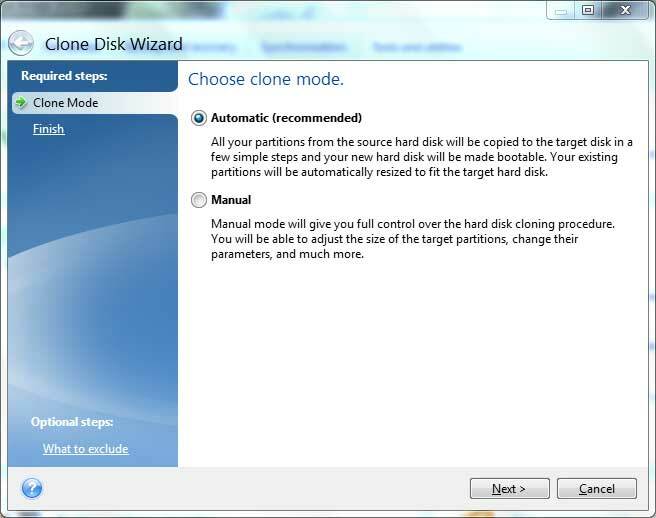 Clicking on Clone Disk brings up the Clone Disk Wizard where you can choose to do an automatic or manual clone. For this review, the automatic setting is fine however if you would need to adjust the size of the target partitions or change any parameters, you would use the manual mode. The manual mode would also be used to upgrade your laptop hard drive. Clicking Next shows what is going to happen to the unallocated disk. With no surprise it will look exactly like the live drive when finished. There is an Options button that allows you to make some additional changes and exclusions but for this review, I just smacked the Proceed button. 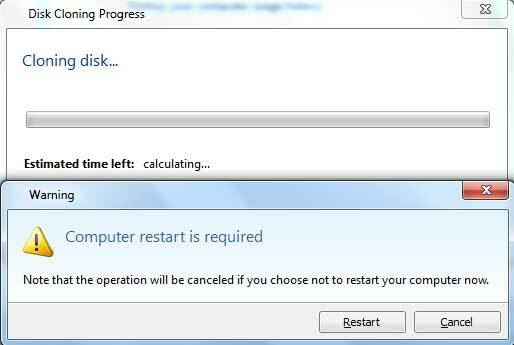 That brought up the following screens warning me that a restart was required to proceed. This will allow True Image to do the clone in a low level mode to ensure all an exact clone of the drive. So I quickly saved this web page and hit the restart button to continue. When the cloning task was complete, there are now two hard drives with the exact same data, Operating System and applications on them as shown here. 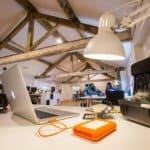 If you were upgrading your laptop hard drive or if your system crashed, you could simply switch drives and to get back to work. Switching a laptop drive is a relatively simple thing to do these days. It is usually just a matter of about five screws and five minutes. If you are not sure where the drive is or how to change it, look it up on the manufacturer’s website. They usually have detailed instructions about how to replace a hard drive. Acronis True Image makes it easy to clone a hard drive as this review shows. So don’t wait until it is too late and you have to do a re-install of all your applications and data, clone you drive now. 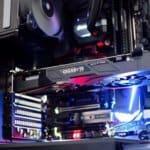 If you have a desktop, you could use this same tutorial to clone that drive as well. See all of the features of Acronis True Image 2017 here. Acronis True Image 2017 has been released and it makes it easier than ever to back up your computer and devices. With just 2 clicks of the mouse, you can do a full image backup of a computer. It doesn’t get much easier than that. 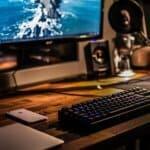 This version added many new features including the ability to backup an unlimited number of iPhones, iPads, and Android mobile devices with Wi-Fi to your computer, it even backs up your Facebook stuff. It is 3 to 6 times faster than the completion when backing up to an external drive and 25% faster than the previous version when backing up to the Acronis cloud. The 2017 version still has all of the other useful features that are essential in a complete backup program. 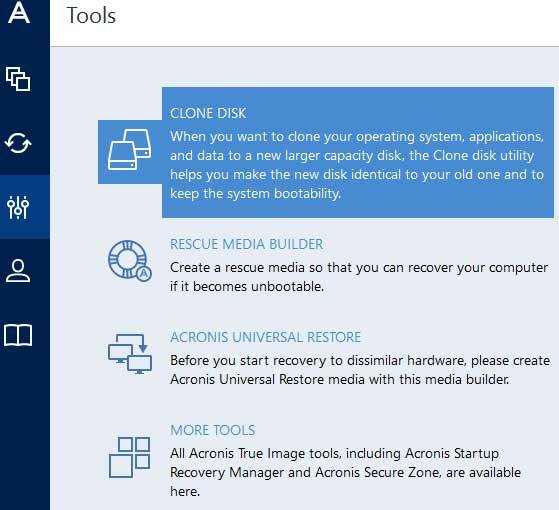 Clone Disk, Try&Decide, Bootable Rescue Media Builder and Startup Recovery Manager are readily available.See our full review of Acronis True Image 2017.